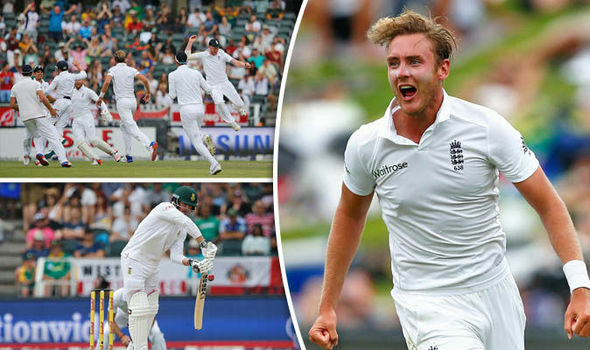 Broad blew the Proteas away with a stunning spell of 5-1 in 31 balls as England took an iron grip on this third Test. He then finished things off with a brilliant diving catch off his own bowling as the hosts were routed for 83 in their second innings. England, who had taken a 10-run first-innings lead after making 323 earlier in the day, then chased down 84 runs inside 23 overs to set the seal on a crushing seven-wicket victory. It saw Alastair Cook’s men take an unassailable 2-0 lead ahead of next week’s final Test in Pretoria, securing England’s first overseas series win since beating India in 2012. Cook said: “It’s pretty special feeling and I’m looking forward to getting back in the changing room to spend some time with a group of guys who’ve done something very special.